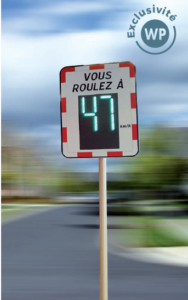 The WP signaling radar speed sign helps to inform vehicle drivers about their actual speed and aims to encourage them to slow down in risky areas with short messages. Generally, they are located in agglomeration but they are also found on risky roads. They can also record the speed and direction of the vehicles in order to establish statistics on the modes of use of the equipped road. The radar can be remotely parameterized via WiFi using a Smartphone, tablet or laptop. No application installation is required: just connect to the WiFi (password protected) of the radar and fill in the username and password in order to access the parameters and statistics of the radar. Injected thermoplastic holder with dimensions 800 x 600 x 35 Mr. Closed back in aluminium customizable by lacquering or anodizing according to RAL (contact us for more information). Measurements accurate to ± 1 km/h. Measurable speed range of 5 to 255 km/h. 3-digit display range from 5 to 199 km/h. WIFI or GSM communication possible. Analysis using our WPSGEO software. Display dimensions 320 x 480 mm. 3 digits with a height of 300 mm. Colour setting according to speed. Alternating display possible with an A14 sign. With the solar-powered version, the photovoltaic panel supplies the system via the control unit fitted directly on the pole (or elsewhere if needed).